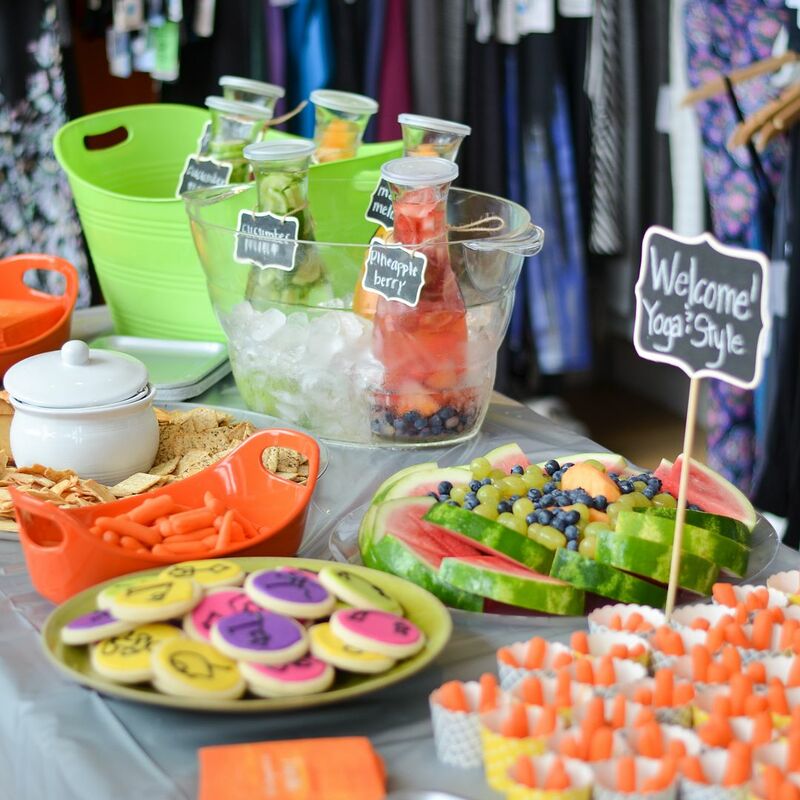 The yoga and style event that I hosted at Yoga Six happened on July 16th! Finally! I say "finally" only because I was so nervous and anxious about the event. It was the first ever blogger event that I've had to host on my own (aka without Jenna), so the planning, inviting, planning, and inviting have been my biggest priorities over the last few weeks. So how did this event come to pass in the first place? Well, I've mentioned Yoga Six on the blog a few times now. In April, they asked if I would be a community ambassador for them, which consisted of me being able to practice at the studios for free in exchange for me bringing a friend to class every other week, posting periodically on social media, and then ultimately hosting a workshop. When it came down to planning a theme for a workshop, I was at a loss! I still consider myself fairly new to Yoga, so I certainly didn't want to paint myself as some expert. I wanted a theme that felt like "me" and the idea I came up with was a style event. 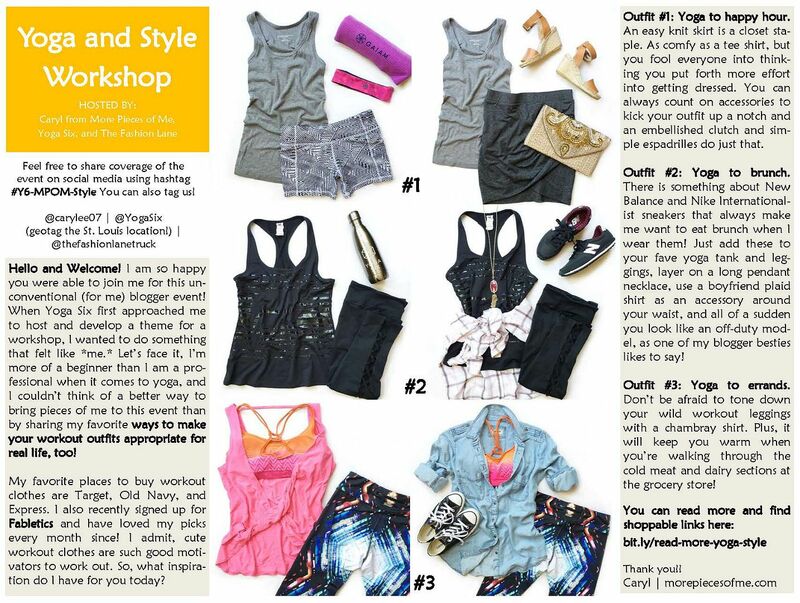 Specifically, providing attendees style inspiration for taking their workout outfits from yoga to real life. 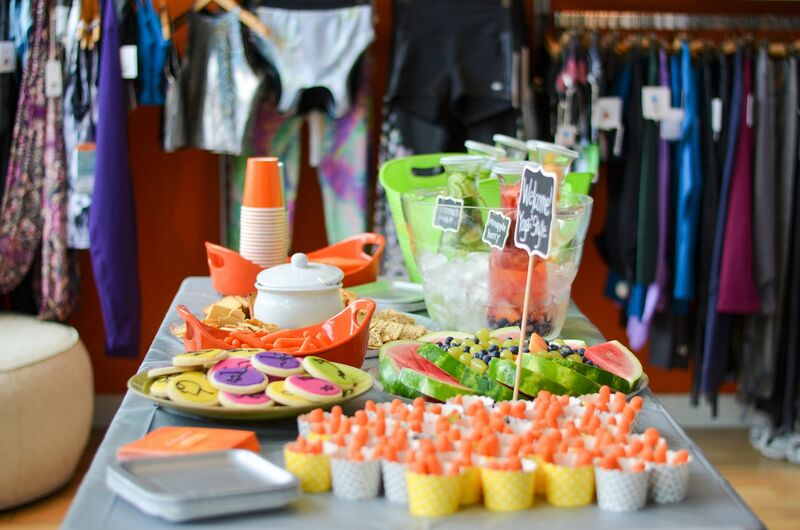 I was thrilled that Laura with The Fashion Lane agreed to bring her truck to the event so that people could shop after their workout. Ok, so that was all fine and dandy, but now what to do about refreshments?! Naturally I wanted to keep the menu super light and generally health conscious since this was fitness related after all. 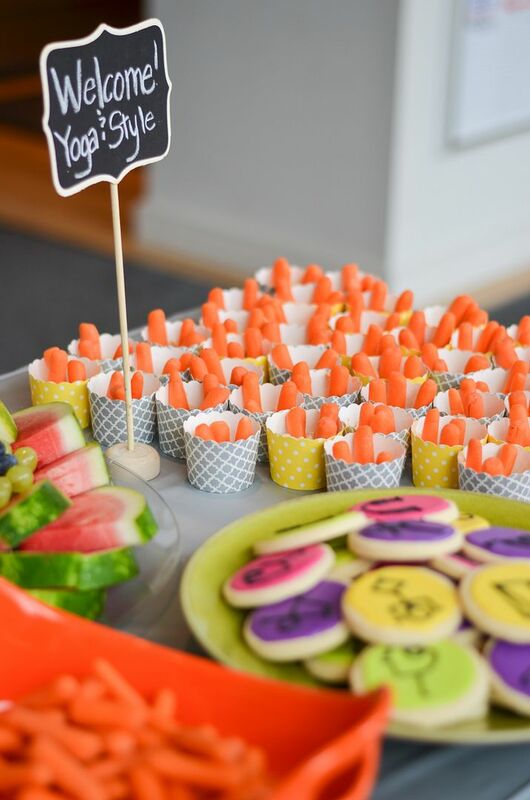 I loved the idea of having pre-portioned little cups of hummus with carrots as dippers. Super easy, and it provided for a nice pop of color. I just bought some regular and garlic hummus from Trader Joe's. Highly recommend. As much as I would have loved to have alcohol at this event, it didn't seem appropriate. But then what do people drink at events if there is no alcohol? I decided to take a stab at making some fruit infused water. I experimented with recipes the weekend before so I could figure out what my favorites were and determine how much in advance I needed to make it to achieve the most flavor. My taste test after 24 hours of infusing did not seem long enough to me, so I made these on Thursday evening for the Saturday afternoon event. I made (2) carafes each of (3) different flavors: 1- mango and cantaloupe, 2- cucumber and mint, and 3- pineapple, strawberries, and blueberries. Each carafe was one liter. My sister in law asked what recipes I used, and I really didn't use any. I got ideas for fruit pairings from Pinterest and also asked a few friends what their favorites were, but otherwise just filled 1/3 of the carafe with fruit and the rest with water. I did add (2) packets of sweetener to each carafe to help bring out the flavor a little better. All of the fruit I purchased from Trader Joe's. I found their fruit was juicier than my neighborhood grocery store. 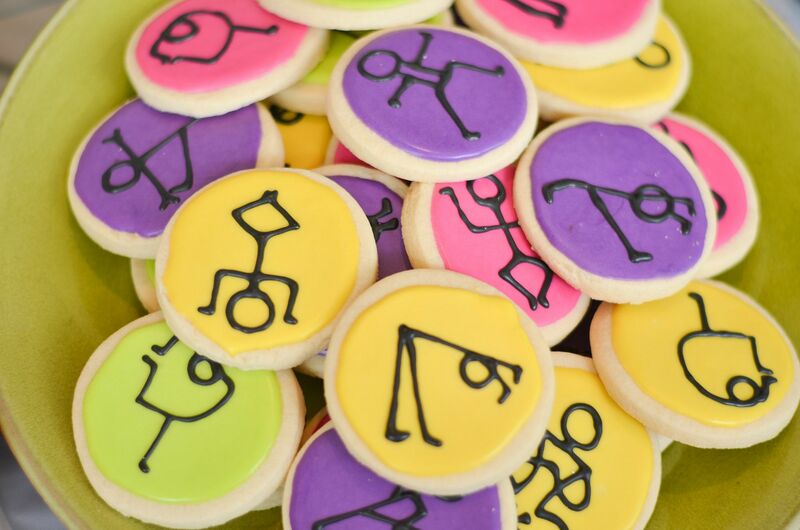 If you've seen photos from any family birthday, you know that we always have cookies at our events. I thought it would be adorable to have cookies here, too, and when I saw this pin on Pinterest, I forwarded it to our cookie guru and she was totally willing and able to replicate them. She lives nearby and just bakes them out of her home! If you're local to the Metro East St. Louis area (aka the Illinois side of the river) and are interested, let me know and I can hook you up with her! I wanted to keep the colors bright, and especially centered around the color orange and I figured that greens and yellows would be the perfect complements. Luckily, I had a couple serving dishes that would be perfect for this. I just had to borrow a couple of large platters and the ice tubs from my mother in law, and then I went to a local party store to pick up the cups, plates, napkins, and tablecloth. For the other snacks, I bought some of Trader Joe's Spinach and Kale Greek Yogurt dip to serve alongside various crackers, toasts, or more carrots! Fruit is so pretty on its own, so I cut up some seedless watermelon and dressed it with some cantaloupe, grapes, and blueberries. 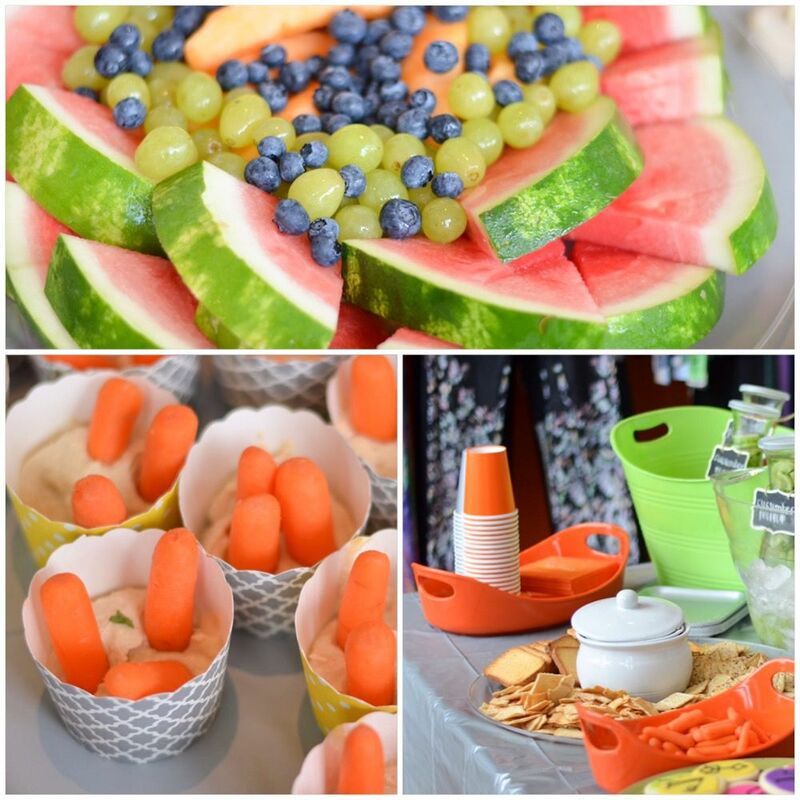 A couple of things I missed - I totally forgot to get photos of the gift table which bums me out! I had 10 gifts to giveaway, and I'm sad I didn't get to document that! Every person that attended was entered to win one of the prizes. The event was only an hour and a half, an hour of that being yoga! That only left thirty minutes for people to eat and shop, and I didn't want to waste everyone's time while they watched me draw names. So, while everyone was getting their yoga on, I had the girls at Yoga Six draw the names so I could label each prize with the winner and have them ready to hand out once class was over. The other thing I missed was that I never got a photo of the Fashion Lane Truck parked in front of the studio!!! Ugh, such a missed opportunity. But this is why you need people 100% not involved in the event assigned to take photos! The husband was helping me get people signed in and such, so I know his head was spinning. Originally, I had only wanted him to take photos, but he certainly did a lot more than that! Oh well, lesson learned! Speaking of photos, the husband attempted to take action photos of the crowd, but I'm most certain that anyone in those photos will kill me if I posted them. Eating is generally not a good action to be doing while being photographed. Nor is talking. So I will spare people that mortification and share this weird shot of my face as I'm talking about these handouts I did for the event. Again, since time was limited, I really didn't have time to do a formal presentation or style session. But I still wanted to deliver on my promise of making this an actual "style" event so I thought the best compromise was to put together this flyer with exclusive content along with a link to read more on a hidden page of my blog. I didn't want to shove this in people's faces as they were trying to check in and get settled into class, so I simply put one in each of the gift bags and left a stack of them on the table for people to grab at their leisure. I then followed up with a thank you email to everyone that attended and attached a PDF file of the handout to ensure everyone had the opportunity to see it in one way or the other! Carrie was the first one to arrive at the event, so she was lucky enough to get the one posed photo I took of the entire event. She wasn't able to stay for yoga (hence her adorable outfit) but she came to mingle and shop and it was so nice to finally meet her in person! Whew!! It was nice to see this all come together! I ended up having 30 people show up for the event, which absolutely excites me! I was thinking I would be lucky if 10-15 people showed up, so I was very overwhelmed by the support! If I could do it again, I wouldn't have put the start time of the event the same time as class was starting. I would have started the event about a half hour or so before class, and then kept the half hour after class making it 2 hours total. And like I said, I shouldn't have had the husband helping me do stuff in addition to taking the photos. Like a wedding, I should have made a checklist of photos I wanted and included a group photo of the whole crowd - perhaps in the actual studio. 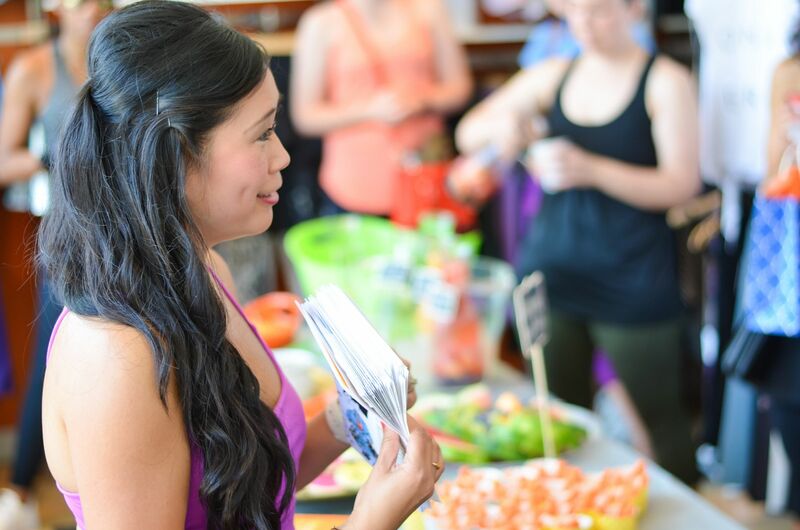 My ambassador time with Yoga Six has officially ended, but if it tells you how much I truly do love the studio, I just purchased a block of classes because I definitely want to continue to practice there, whether I have to pay or not! It's challenging and exciting and I burn a ridiculous amount of calories, so I don't want to see all that come to an end! I would still love to meet you for class one day if you are local! Just let me know!! Thanks for reading this if you've gotten to the end! And a special shout out to a few of the local bloggers that attended the event: Jenna, Psyche, Olivia, Jeanne and Emily (who are 2/3 of Fashion by Committee)! I was there in spirit, this event looked like so much fun. It came out so well...those cookies look awesome! Great event! So much fun! Thank you for hosting. 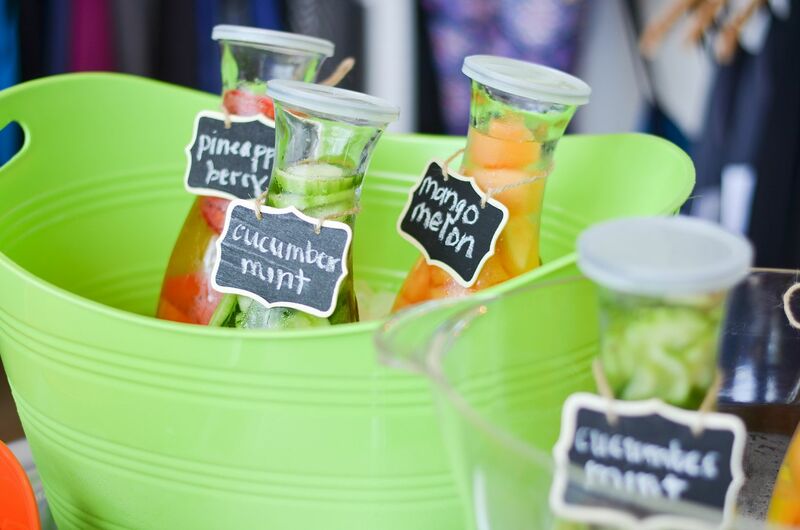 The infused water was a great treat after the class. I loved my door prize and have been using all the goodies, especially the yoga mat cleaner. You are so sweet!! I am so glad I got to meet you in person!! One of these days we will have to make our yoga schedules align! Thanks again for everything! Thank you for the great event! It was great to finally meet you! I find the event well thought out and the fashion lane truck was a nice addition. I love my CC cross body bag prize, been using it whenever I can (though being a shortie I had to punch extra holes in the strap to shorten it). Thanks again!